Cairns is the Capital of Far North Queensland (FNQ), the largest region in Northern Australia (population circa 286,000) and is a strategic gateway to the Pacific, Asia and beyond. With a resident population of 165,000 people and an average 30,000 additional visitors staying in the city on any given night, Cairns is one of the largest and most dynamic regional cities in Australia. Unique liveability and solid economic fundamentals have seen Cairns experience significant population growth (2.3% per annum in the 15 years to 2016) – well in excess of the national growth rate. Significant private investment and renewed business confidence has also seen the Cairns region unemployment rate reduce significantly in recent years. The region’s unemployment rate currently sits at 6.4% (SA4, Nov ‘18). Cairns is strategically positioned to support the Federal Government’s Northern Australia agenda and also has an important role to play in alleviating the pressures being experienced in some of the nation’s metropolitan cities as a result of population growth and migration. But to enable Cairns and the broader FNQ region’s enormous potential to be realised, investment in enabling policy and infrastructure will be critical. Federal Government investment in the Cairns region will not only support the local community but will deliver benefits for the region and nation as a whole. It is recognised that in order to be effective, regional investment and policy needs to be developed in the context of a broader regional strategy to ensure such initiatives are complementary and contribute to the realisation of a long term vision. With this in mind, Cairns Regional Council and key regional stakeholders have worked together and invested significant time and resources to develop the Cairns 2050 Shared Vision. This vision incorporates the views and priorities of the Cairns community as expressed through the 2016 Our Cairns Survey, a community survey conducted by the Cairns Regional Council which attracted over 6,000 responses. The vision has also been developed in the context of relevant Federal and State policy settings and strategies. The Cairns 2050 Shared Vision provides a framework that will deliver economic prosperity, quality of life and liveability for the Cairns community both today, and for the generations that follow. It carries the support of key stakeholders and includes details of the projects, investment and policy required for the vision to be realised. Despite only being officially launched in late 2018, the vision has already received hundreds of registrations of support. The Cairns 2050 Shared Vision can be viewed at www.cairns. qld.gov.au/ vision2050. 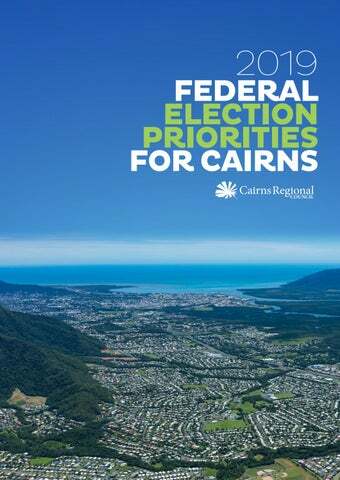 The Cairns 2050 Shared Vision has provided the foundation for the Federal Election Priorities contained in this document. The following projects represent key Federal Election Priorities for Cairns. They have been drawn from the Cairns 2050 Shared Vision and will make a significant positive contribution to the economic prosperity and liveability of the Cairns region. Commitment to undertake a detailed independent review of the Great Barrier Reef (GBR) and Wet Tropics Rainforest (WTR) management structures and GBR/ WTR funding (quantum and structure) requirements for long term management and preservation of these critical ecosystems. Funding commitments to deliver CQUniversity’s Cairns Campus and Community Impact Plan and James Cook University’s Enterprise Bundle projects. Commitment to financial and administrative assistance to further build the Cairns - Papua New Guinea connection, with the ideal platform being a PNG NRL team with home grounds in Cairns and Port Moresby. Expansion of the NRL has been identified as a key pillar in the region’s goal to build a rectangular stadium, and the current changing geo-political balance in the Pacific represents a timely opportunity. Commitment to the expansion of HMAS Cairns and ancillary facilities (including specific funding allocations) as well as commitments to undertake naval maintenance activities in Cairns. $323 million towards the construction and establishment of Nullinga Dam to support agricultural development on the Atherton Tablelands and also support the long term urban water security needs of Cairns. $13.3 million contribution towards the estimated $39.8 million capital cost of the Cairns Gallery Precinct. This would represent Federal, State and Local Governments each contributing one third. Extension of the National Land Transport Network to Smithfield (northern suburb of Cairns) and funding commitments to deliver capacity improvements on this key road corridor. $800 million towards an estimated $1 billion project to resolve safety, capacity and reliability issues on the Kuranda Range Road. Commitment of resources and funding to undertake the concept studies, feasibility and business case work required to establish the viability of a variety of renewable energy projects, as an important investment in the region’s long term energy security. University Hospital Status for Cairns Hospital Funding commitment for land acquisition and facility development for a research institute that will support Cairns Hospital achieving university hospital status. Government funding of $100m to launch new aviation routes. Air connectivity to Cairns is key to the economic development of the region, opening up new visitor markets, promoting growth for the international education sector and providing agricultural export opportunities. Cairns lies at the gateway to two of the world’s greatest natural wonders in the Great Barrier Reef (GBR) and Wet Tropics Rainforest (WTR), both of which are World Heritage listed. As well as the GBR’s unquestionable environmental value, it also underpins significant components of the Cairns region’s economy, in particular tourism. Recent analysis by Deloitte Access Economics estimated that: The asset value of the GBR is $56 billion. The GBR provides support for 64,000 Australian jobs. The GBR generates $6.4B in revenue annually. The condition and factors impacting reef health need to be better understood and addressed as does adverse domestic and international perceptions on the health of the GBR. Crucially, a significant proportion of the river systems flowing into the GBR have their sources within, or flowing through, the World Heritage listed WTR. The health of the Rainforest has a direct impact on river catchments and marine ecosystems with flow-on impacts on water quality and the health of the GBR. management and preservation of these critical ecosystems. Responsibility for management of the WTR has been devolved to the Wet Tropics Management Authority. The Australian and Queensland Government’s respective responsibilities in cooperating to protect and conserve the Great Barrier Reef Marine Park (‘GBRMP’) were incepted in the Emerald Agreement in 1979, and most recently updated in the Great Barrier Reef Intergovernmental Agreement 2015. These existing management structures are overly complex and lack clarity of purpose and responsibility. The level of funding to support GBR and WTR preservation and management also needs to be reset. A single, de-politicised World Heritage management body (such as a commission) would ensure transparency, accountability and effectiveness. A review of the management structure and funding also sends a powerful message that this nation has the boldness, vision and leadership to do what it is necessary to protect these two global icons. The preservation and effective management of these two iconic natural assets must be recognised as a strategic priority of national and global importance if their significant social, community and economic benefits are to be secured for future generations. HMAS Cairns and Border Force Commitments HMAS Cairns’ primary responsibility is to provide maintenance, logistic and administrative support for Cairns based assets, Pacific-class Patrol Boats and Border Force vessels. The recent announcement of the establishment of a joint US/ Australian/PNG naval base on Manus Island further underlines the strategic importance of HMAS Cairns and which is consistent with the ADF Posture Review (2012) in terms of the geographical positioning of defence assets. This also acknowledges a) the ongoing strategic shift in our region and b) there is a re-balance taking place in the Asia-Pacific. Continued investment in the HMAS Cairns base not only strengthens Australia’s border security and defence capabilities but has significant flow on economic benefits to the Cairns region and supports skills development in the marine maintenance sector. Further, the recruitment and retention of personnel is a key issue for Defence. This region boasts one of the highest retention rates in the Australian Defence Force (ADF) due to the lower costs of living and a lifestyle that is broadly appealing to Defence Force families. COMMITMENT REQUIRED Commitment to the expansion of HMAS Cairns and ancillary facilities (including specific funding allocations) as well as commitments to undertake naval maintenance activities in Cairns. The economic contribution from this sector is also stable and not subject to the impact of fluctuations in economic conditions and other factors such as interest and foreign exchange rates. As a result, this sector plays an important role in supporting regional economic resilience. COMMITMENT REQUIRED $323 million towards the construction and establishment of Nullinga Dam to support agricultural development on the Atherton Tablelands and also support the long term urban water security needs of Cairns. • Existing close-by Mareeba, a highly developed agricultural support centre • Existing highly developed transport services to southern markets and close to Cairns international airport and Cairns seaport for future export growth Nullinga Dam would underpin additional agricultural production worth $200 million a year to Far North Queensland, and is vital to the further growth of Far North Queensland’s agricultural industry, which already leads the way in Northern Australia and is placed to become one of the country’s most important food bowls. This in turn would lead to maximising our export and distribution industries and support countless jobs across the region. The CSIRO Northern Australia Water Resource Assessment, published in August 2018, identified the Mitchell Catchment as a priority region, and identified that Nullinga Dam has the potential to ensure the long term security of the Cairns water supply. A preliminary business case for the Nullinga Dam project was completed in 2017 and a detailed business case is currently being undertaken by Building Queensland engaging with the project proponent (SunWater) and stakeholders more broadly. Funding commitments are required to ensure this critical regional infrastructure project is able to proceed. Cairns is recognised as the Arts and Culture Capital of Northern Australia. The Cairns Gallery Precinct is a project that strongly supports this status and complements recent regional investment in arts and cultural facilities, events and programs. These include the Cairns Indigenous Art Fair (CIAF), Cairns Performing Arts Centre (CPAC) and Munro Martin Parklands, Centre of Contemporary Arts refurbishment among others. The project will transform and connect three heritage listed buildings in the Cairns City Centre (the Cairns Art Gallery, ‘Old’ Court House and former Mulgrave Shire Council offices) and establish a new world class gallery building to create a dynamic and unique gallery precinct with benefits for both the local community and domestic and international visitors. A significant proportion of Cairns’ population identify as First Nations peoples. Cairns is also the principle connection point for the exchange and celebration of indigenous art and culture from communities throughout Cape York and the Torres Strait. The Cairns and Great Barrier Reef region is home to Australia’s highest proportion of Indigenous Australians and its greatest diversity of Indigenous cultures. COMMITMENT REQUIRED $13.3 million contribution towards the estimated $39.8 million capital cost of the Cairns Gallery Precinct. Community demand for the arts, the burgeoning local creative sector, the opportunity to showcase more indigenous arts, and the need to diversify our tourism offering - warrants an increase in scale and diversity in terms of visual arts infrastructure. Finally, in addition to the significant economic impact and employment created during construction, once operational, the project will add $19.4 million per annum to the regional economy (Gross Regional Product) and support 179 ongoing full time jobs through its direct operation and induced tourism expenditure. Cairns Regional Council is advocating for a tri-partite funding arrangement for the project with Federal, State and Local (Council) government each contributing one third of the project’s total capital cost of $39.8 million. The project business case is expected to be completed in early 2019. The road networks both within Cairns and connecting Cairns to regions located to the north, south and west are critical enablers for the regional economy. An effective road transport network also contributes to the region’s liveability by facilitating efficient travel both within region and to/ from outside the region for work, leisure and social purposes. Safety considerations for all modes of transport are also an important consideration. Key road network projects where Federal government support is required include: Extension of the National Land Transport Network (which currently terminates at Draper Street just south of the Cairns CBD) through to Smithfield (northern suburb of Cairns). This will unlock increased investment in the elements of the road network which support connectivity with the Cairns Airport and Cairns Seaport as well as delivering improved road connectivity to the north of the city and west to the Atherton Tablelands and beyond. This improved connectivity would deliver significant economic, safety and liveability benefits to Cairns and the broader region. COMMITMENT REQUIRED Extension of the National Land Transport Network to Smithfield (northern suburb of Cairns) and the funding commitments to deliver capacity improvements on this key road corridor and $800 million towards an estimated $1 billion project to resolve safety, capacity and reliability issues on the Kuranda Range Road and to enable the road to deliver significant economic benefits for the broader FNQ region. Funding to support safety, capacity and reliability improvements on the Kuranda Range Road. The Kuranda Range Road links Smithfield to Kuranda and provides critical connectivity between Cairns, the Atherton Tablelands (including Mareeba), the Cape York and the Gulf of Carpentaria. An Impact Assessment Study of the road by Maunsell McIntyre (now AECOM) in 2000, identified that the road’s inadequacies contributed to poor safety, poor economic performance (travel times, vehicle operating costs and inability to accommodate freight-efficient vehicles) and poor reliability. 18 years on, these issues have not been adequately addressed with significant investment now needed to deliver increased capacity, improved safety and to enable the road to deliver its full economic potential for the region. Renewable Energy Our unique position, of acting as custodian for two World Heritage Listed areas in the Great Barrier Reef and Wet Tropics Rainforest means that Cairns must lead the way in championing clean energy. Our energy sources must be sustainable, and environmentally low-impact. Security of future affordable energy supply will be a critical factor in the region’s sustained economic development and future population growth. Renewable energy projects need to play a key role in providing this energy security. To achieve effective energy security, a mix of renewable energy sources is essential. The abundance of sunshine, wind and water resources in the Cairns and Far North Queensland region mean that the development of a range of renewable energy projects including solar, wind farms and pumped hydro all have potential and warrant further attention and investigation. COMMITMENT REQUIRED Commitment of resources and funding to undertake the concept studies, feasibility and business case work required to establish the viability of a variety of renewable energy projects, as an important investment in the region’s long term energy security. 100% renewable energy projects with minimal environmental impact should be prioritised. Appropriately capturing and developing our region’s significant natural resources (of water, wind and sunshine) will help solve the energy trilemma of reliability, affordability and sustainability. Energy security and pricing are significant factors that influence investment attraction, small business sustainability, and the improvement of the quality of life of community members. This also aligns with the Cairns brand of “clean and green.” This benefits Australia not only in terms of the energy and economic outcomes, but must be viewed also as a tourism must. We are a world leader, and recognised as such if we follow the formula of Great Barrier Reef / Wet Tropics Rainforest = Cairns = Green = Sustainable = World’s best natural area management = successful tourism. (NRL / Rectangular Stadium) In Papua New Guinea, rugby league is the national sport and followed with fanaticism by the 8 million strong population. Australia is competing for influence in the region, and football could be a platform to further build ties between our two countries. Cairns is the closest Australian city to Port Moresby, less than a 90 minute flight away, with a large expat community of Papua New Guineans calling Cairns home. In fact, the third most common country of origin for Cairns residents born outside of Australia is Papua New Guinea. No single act from an Australian government would do more to strengthen the economic, social and cultural connection between our two countries, than bringing a PNG rugby league team into the NRL. No other city would be a more appropriate location for an Australian home ground, than Cairns. Rugby League is an effective way to build stronger ties between Australia and Papua New Guinea at a time when other powers are jockeying for influence. The Australian Government recently announced plans to develop a USA-supported functioning naval base at Lombrum, on Manus Island. A foreign policy initiative supporting NRL expansion, and giving Papua New Guinea a helping hand to operate within the national league, would build immense soft diplomacy power for Australia. COMMITMENT REQUIRED Commitment to financial and administrative assistance to further build the Cairns - Papua New Guinea connection, with the ideal platform being a PNG NRL team with home grounds in Cairns and Port Moresby. Expansion of the NRL has been identified as a key pillar in the region’s goal to build a rectangular stadium, and the current changing geo-political balance in the Pacific represents a timely opportunity. The NRL says a review is currently looking at the structure of the league, and that PNG would be considered as part of any expansion review. At its national conference in 2018, the Labor party moved a motion, unanimously supported, to explore the admission of a PNG side to the national rugby league competition if elected. This represents a timely, tremendously exciting and realistic opportunity for the region. Hospital Upgrade to University Status Cairns Hospital is a significant regional health facility with a staff of nearly 6,000 people and over 79,000 admissions in the year to 30 June 2018. Expansion of the facilities and status of the Cairns Hospital as well as investment in the broader regional services managed by the Cairns and Hinterland Hospital and Health Service will be required to meet the future needs of a growing regional population. The region’s unique demographics, including significant visitor and Indigenous populations, are also a key consideration when planning for the future health needs of Cairns. The aim is for Cairns Hospital to become a university hospital within the medium term and for the hospital to continue to expand the higher level of services offered locally. COMMITMENT REQUIRED Funding commitment for land acquisition and facility development for a research institute that will support Cairns Hospital achieving university hospital status within the medium term. Cairns is the education hub of Northern Australia. Within the education landscape are two significant and well established universities in James Cook University (JCU) and CQUniversity (CQU). Continued investment in the facilities of these two universities will be required to not only retain key human intellectual capital within the region but also to support the continued growth of the region’s international education sector. JCU Cairns Enterprise Bundle These initiatives have been developed to help create the knowledge community needed to drive a knowledge economy, attracting investment, organisations and knowledge workers to Cairns. Following elements of the Enterprise Bundle being funded, the remaining projects are: 1. Tropical Sports Conditioning Centre (TSCC) is part of a proposal to create a network of top end training facilities in Cairns with the JCU led TSCC facility being the hub. 2. Tropical Australian Academic Health Centre (TAAHC) - $10m over 3 years The purpose of TAAHC is to improve the health of the northern Queensland population and grow prosperity in the tropical region through an alliance that enhances collective capability in tropical health and medical research, health care and workforce development. CQUniversity Cairns Campus and Community Impact Plan CQUniversity’s (CQU) Cairns CBD campus has reached capacity significantly ahead of expectations. In 2018 alone, CQU expanded to 3 additional locations around the CBD to support their Engineering, Aviation and Sport Science programs. With further growth evident, CQU are now looking for assistance to buy or build premises that will give them a more secure footing in the Cairns CBD. This will also allow opportunities for more purposebuilt facilities to increase specialised course offerings (particularly in the allied health disciplines) that do not currently exist in Cairns. Air connectivity to Cairns is key to the economic development of the Cairns region. It opens up new visitor markets for the tourism sector, provides opportunities for the export of agricultural produce and promotes growth of the international education sector. A daily international wide-body flight to Cairns is potentially a $200 million a year export business, with $100 million of international visitor spend, $50-150m of agricultural produce sales, and more than 650 new jobs for the region. There are additional flow-on benefits as other trade is enabled by new air routes. These benefits are widely dispersed across businesses in the sector An international flight to Cairns is potentially a $200m pa export business There is unmet demand for at least four new daily flights; worth $800m pa economic benefit Establishing a new route requires approx USD $30m in start-up costs Cairns Airport is seeking to assemble four airline support packages There is significant international visitor growth that would be unlocked by additional capacity, without reducing passengers on existing flights. To unlock this growth, Cairns Airport is targeting four priority new routes one each from the Middle East and Southeast Asia (to serve Europe), one from Shanghai and one from North America. Together these would provide $800 million per year additional economic benefit to the $14 billion Cairns regional economy. COMMITMENT REQUIRED Government funding of $100m to launch new aviation routes. Airlines increasingly look to communities, private enterprise and governments to offset the risk and share the economic benefit by contributing to the start-up costs. This is in addition to ongoing destination marketing in source markets from Tourism Australia, Tourism and Events Queensland, and Tourism Tropical North Queensland. Currently more than 80% of international visitors through Cairns Airport travel on domestic flights. Due to the volume of international passengers flying-in on domestic routes, the domestic constraint is at a premium. More international services direct to Cairns will create more capacity for domestic visitors and encourage international visitors to stay longer and spend more while in the region. Cairns Airport is seeking to assemble four airline support packages to support the start-up of these four key routes. To alleviate pressure on the Cairns aviation network, there are opportunities to further expand international and domestic connectivity for Cairns and thereby grow access from key visitor source markets in Australia, Europe, NZ, Asia, North America and the Middle East. A City Deal is a tripartite arrangement bringing together all three levels of government (Federal, State and Local), the community and private enterprise to drive economic development and liveability within Australia’s cities. A number of cities in Australia have already secured City Deals. The Federal Government’s Joint Standing Committee on Northern Australia has recommended the establishment of a City Deal for Cairns as a priority. 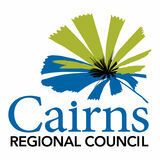 Cairns Regional Council and key stakeholders have worked collaboratively to develop the Cairns 2050 Shared Vision (www. cairns.qld.gov.au/vision2050) which provides a framework to deliver long term economic prosperity and liveability for Cairns. This vision provides a strong foundation for a Cairns City Deal. A City Deal for Cairns would ‘fast track’ the implementation of the numerous key initiatives outlined in the Cairns 2050 Shared Vision by securing the commitment of all three levels of government to the funding and policy required for implementation. COMMITMENT REQUIRED Commitment to establish and implement a City Deal/ City Partnership for Cairns in conjunction with the Queensland Government and Cairns Regional Council to support the implementation of the Cairns 2050 Shared Vision. A City Deal would work to align the planning, investment and governance necessary to accelerate growth and job creation, and stimulate urban renewal. Despite its regional status, the Cairns area has a global status owing to the Great Barrier Reef and Wet Tropics Rainforest. A City Deal will help to secure the future prosperity and liveability of Cairns.